Celebrity Cash is nearing its 10th Anniversary and we still stand by our 100% NO SHAVE policy. We know what it takes to stick around in this industry and you can be rest assured you will always be paid… on time! We give you the tools to maximize your traffic and earn the highest income possible. Rev Share Program Become an Affiliate! You receive 50% of every initial signup and 50% of every recurring monthly fee that each member pays while their account remains active. With our incredible retention, you’ll average $40+ for every join you send, over the lifetime of each membership. We offer higher payouts to webmasters with high join per day averages. Rev Share affiliates are paid weekly by CCBill. Flat Pay Program Become an Affiliate! Want to get paid “up front”? Our Flat Pay program provides an immediately payout per join, including trials! Our current Flat Pay amount begins at $25.00 per join. however, Webmasters with high join per day averages may qualify for higher a payout! Flat Pay affiliates are paid every other Friday by ICG. Referral Program Become an Affiliate! Celebrity Cash believes in rewarding webmasters for referring other webmasters and pays you 5% of every dime your referred webmasters earn… for life! It’s a great way to help others earn money and increase your income at the same time. Referral fees are paid weekly by CCBill. Bonus and Incentive Programs Become an Affiliate! 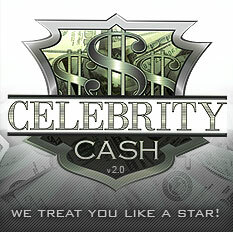 Celebrity Cash believes in rewarding its affiliates for their performance. We hold periodic contests and special “Reward Days” to say “thanks” to our affiliates for promoting our sites. Watch for announcements in the member’s area. Copyright © 2014 Celebrity Cash (www.celebritycash.com) All rights reserved.